2 SRC posts in 2 weeks! You must think I've lost my marbles. But no, I haven't, not yet atleast ;) Last week was a bonus themed SRC reveal but this post today is my regular Group A reveal. For this month I was assigned Sid's blog, Sid's Sea Palm Cooking. I've been watching this blog for a while now and when I received my assignment, I was quite excited to be cooking from this blog. I almost fell off my chair when I read Sid's tagline from her "About" page. Turns out we are kindred sisters at heart. In her own words, this is what she has to say, "Sid cooks, entertains, plays with food, and hates to clean the kitchen after a marathon cooking/baking session." I feel ya Sid. I love the prepping, the cooking and the serving and all that. But absolutely hate the cleaning up after. OMG, I can't believe I have said that out loud. Fortunately, I have an absolutely amazing husband, who almost always helps with the clean up. And that makes me one lucky and extremely happy girl. Back to Sid and her blog. She hosts Tapas night once a month and her friends bring along a dish each to share. That is a wonderful idea for a potluck and they put together some pretty impressive spreads month after month. While I was perusing her blog, a few posts caught my attention. I loved the look of these Game Day Wings, and her Za'atar Pita Crisps looked intriguing. I had also shortlisted her recipe for Tonkatsu and her Candied Ginger and Lime Cookies. In the end I went with her Breakfast Salad. I was so pleased I picked Sid's Breakfast Salad recipe. Though it is a simple recipe, for me it was a first. I have never poached an egg before. And until now, I have always found or made excuses and put off trying my hand at poaching eggs. To be honest, I always found it a little intimidating. Today I decided to bite the bullet and give it a shot. I'm so happy that I did. Turns out, poaching eggs is actually really easy. I wonder why I waited this long to try it out. It is a really healthy way to enjoy an egg for breakfast too, because there is absolutely no oil / butter involved. I even managed to get a runny yolk and all. This might just be my new favorite way to eat an egg now. Thank you so much Sid for the much need nudge. If you haven't tried poaching an egg yet, do give it a try. The salad itself, makes the dish a very wholesome breakfast. I didn't have any mushrooms in the kitchen when I set out to make this, so I left out the mushrooms. But because my husband looked and the salad leaves and then looked at me thinking I had lost my mind, I decided to coax him with a few sausages. I fried up some cheese kransky sausages and sliced them up. 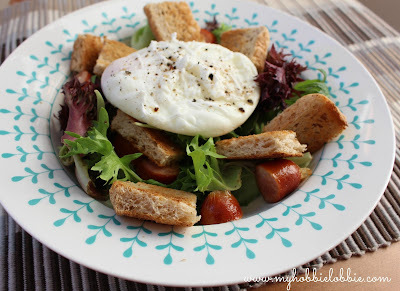 With some croutons and salad dressing, this makes a super yummy and hearty breakfast. You don't feel heavy or overwhelmed with grease after sitting down to this salad. Though this was my first attempt at a breakfast salad, I know for sure this wont be the last. I really enjoyed this for breakfast. I probably enjoyed this a little more than I thought I would. I have made this a couple of times now, once using store bought French Salad Dressing and once with my go to dressing comprising of a squirt of lemon juice and a sprinkle of salt and freshly cracked black pepper to taste. Both were really good. Bring about a liter of water to a boil in a pot. Add 2 tbsp vinegar to the boiling water. Crack an egg into a ramekin. Using a spoon, stir the water a few times till you have a little whirlpool going in the pot. At this stage, gently pour the egg from the ramekin into the water. Cook of medium heat for about 2-3 minutes or till the egg whites have just set. Drain using a slotted spoon and place on a paper towel to drain off any excess water. I turned the sliced of bread into croutons the lazy easy way. Simply toast it up in the toaster till browned and crunchy. Cut up into pieces and croutons are done. Heat the oil in a pan and fry up the sausages till cooked. Carefully slice the sausages. In the serving plate, place the salad leaves and drizzle a little salad dressing over. Sprinkle the sliced sausages and crouton pieces over. Place the poached egg on top and sprinkle some salt and pepper on the egg. Don't forget to check what the others in Group A have whipped up this month. **Disclaimer: This is NOT a sponsored post. I have just mentioned what type of salad leaves I've used here. I would love this, if not for breakfast for a light lunch... perfect! Have a wonderful Reveal Monday! I love this as a breakfast idea. So unique and fun! Thanks for the kind words, I love making this for breakfast. And thanks for the tip on making croutons, quickly. I feel a DUH! moment here, but using the toast, brilliant. And much quicker than my way. I see this being a regular feature atleast on weekends, my take on croutons is a cheat, yours is the real thing! Breakfast salad? Are you kidding me? I love, love, love salad. Who knew I could eat it for breakfast?! I can't wait to try this. Thank you! Why have I never thought to eat salad for breakfast? This looks yummy. I have never poached an egg, either, but it does sound easy. I should probably try it, too. I think a salad for breakfast is a brilliant idea! It's been years since I've poached an egg, and I've never had one come out as perfect as yours did! Delicious sounding salad! Perfect breakfast! What a fun recipe! I love adding eggs to things. Especially drippy eggs. Now I want to have one of these salads ASAP! 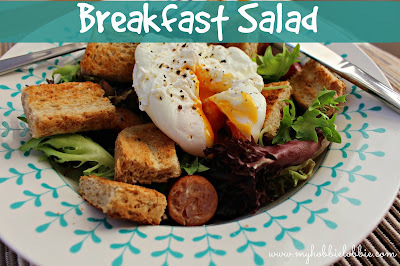 I have been mulling over breakfast salad for awhile. So glad to see it make an appearance! Quick croutons = genius! Wonderful SRC choice!